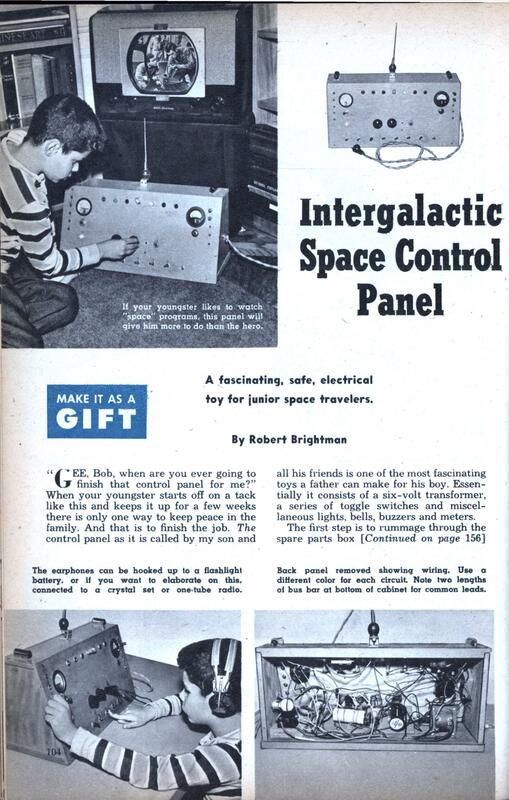 A fascinating, safe, electrical toy for junior space travelers. “GEE, Bob, when are you ever going to finish that control panel for me?” When your youngster starts off on a tack like this and keeps it up for a few weeks there is only one way to keep peace in the family. And that is to finish the job. The control panel as it is called by my son and all his friends is one of the most fascinating toys a father can make for his boy. Essentially it consists of a six-volt transformer, a series of toggle switches and miscellaneous lights, bells, buzzers and meters. The first step is to rummage through the spare parts box and amass all the electrical parts you can possibly use. Visit your local radio shop lor the necessary transformer to convert 117-volt alternating current into harmless six volts. As you can see from the wiring diagram, two lengths of bus bar along the bottom of the box form common connections for various parts. It is a good idea to first assemble all the parts you are going to install and then drill and cut the necessary holes in the sloping front of the control, panel. Of course you can do this with the box assembled, but you will find it much easier to do this before it is finished. The switches are wired so that they do not turn on the lamps directly above them. If they did, operation would be too easy. As every parent knows a small boy always likes to do things the hard way! Wire them so that they turn on the lamps or bells farthest from the switches. The voltmeter is wired across the six-volt posts of the transformer and will of course always register six volts. The milliam-meter is wired in series across one of the lamp circuits or can be wired in series with one of the secondary leads of the transformer. The more controls and switches the merrier. You’ll find that after a while you may want to add more devices. Simple enough, just remove the back and go to work. The earphones and corresponding jack were in fact such an added improvement. The jack is merely connected to a flashlight battery. Flipping a switch turns on the juice so that a clicking is heard in the phones. The two knobs shown are rheostats to dim two of the lights. Another added innovation is the series of banana jacks on both sides of the panel. The upper two on the left are connected to the secondary of the transformer so that a source of six-volt alternating current for testing is readily available. At least two switches must be turned on before any of the lights will work. The first switch turns on the line current to the transformer. This is rigged so that a 7-1/2-watt pilot light glows when it is on “on.” The next switch completes the circuit in the secondary of the transformer. At this point any one of the various other switches can be turned on to make the lights blink, bells sound, buzzers burp and pandemonium reign. 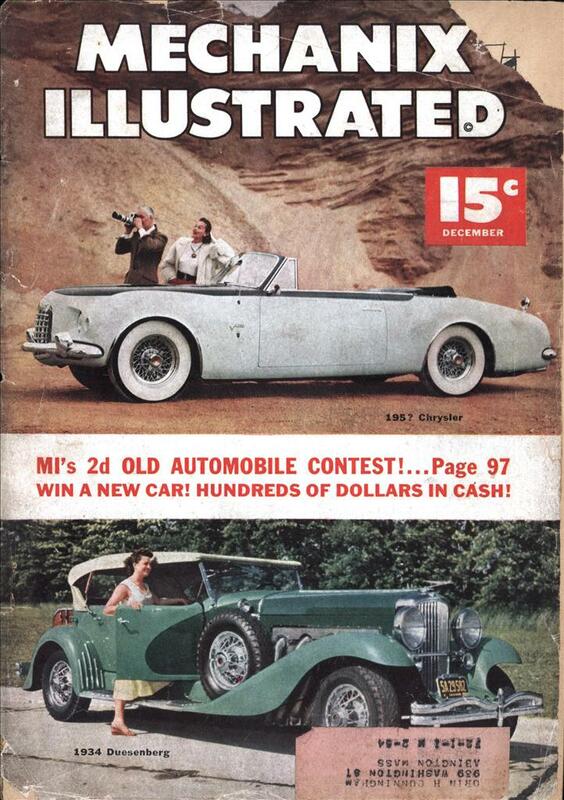 Note the automobile curb feeler. This is hooked up to a buzzer and looks like a miniature antenna. Touching it of course causes the buzzer to sound—only when its switch is “on.” Such secondary switches are a constant source of delight to a boy and his friends. Sometimes the buzzer will work and sometimes it will not, depending-of course upon the switch position. I had forgotten that I built something similar–but simpler and smaller–for my toddler son, who’s now 26. A couple of lights, beepers, buzzers. I used a variety of different switches: toggle, rocker, button, figuring it would provide some tactile training. I don’t recall the box sticking around very long, because he began playing games on the Apple ][ about the time he started school. Maybe that toy was a good thing. He’s following in the old man’s footsteps, starting in the OS group at Apple on Monday. He’ll actually be working with some of my former colleagues from 10+ years ago. My cousin had a similar toy when he was young and it was essentially a bunch of switches connected to pilot lights. He also works for Apple now as a chip designer and on his time off he still plays with lego. 117 volt AC and curb feeler, there are two things you don’t hear about anymore. Reminds me of a USB port box my boss got me a few years back. I often wondered how much trouble I would get in if I tried using it on a airplane. Why is the kid wearing headsets? I don’t see any headset plug. I actually had a little box with a power supply and a bunch of relays. It was a fun toy. 🙂 No, I didn’t get a computer till I was 13 or so. He calls his father Bob? My parents were too cheap to build something like this for me; I could only draw the controls on a piece of wood and pretend to press buttons. Result: I’ve never worked for Apple.